Although winter is finally over, it is still somewhat cold outside and we have to turn on the heat. Recently, I have found a very interesting product which can be used by anyone to heat their home or apartment for free. Even if you rent, you can do it without getting the land lord involved. The only things you’ll need are south-facing windows and a thermal mass solar window. 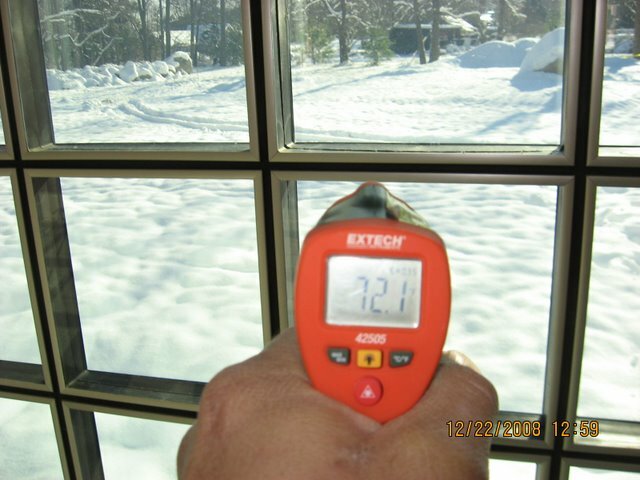 As you can see from the image above these windows measure 72 degrees F, while outside temperature that day was 22 degrees, with a 27 F high. (Historic weather data). The 50 degree difference in temperature is the free heat that enters your home and stays. Here is how the Solar Thermal Mass windows work in a nut shell: it as a 2 inches thick air and water-tight container filled with special liquid that collects and stores solar thermal energy. Special chemicals added to the liquid prevent stain deposits on the inner walls if the unit. In the picture above, these units are used as building blocks, and cover almost half of the south-facing wall. In the winter, when the sun is low, these windows collect solar heat since the sun hits them directly. In the summer, the sun is much higher and with appropriate shading, these thermal mass windows keep the home well insulated without collecting any heat. Additionally, a special low emittance and high solar gain argon filled window unit is installed just outside the thermal windows, so they are not directly exposed to the outside temperature. The picture above was taken in a new construction house, but for most people the interesting question is how to use these thermal mass windows in an existing home or apartment? My plan was simple: I have 6 large windows that face south and an unheated balcony, which cannot be used in the winter because it is too cold there. In the heated living space, we have new double pane Low-E windows installed, which are much more efficient than the original single-pane wood windows from the 50’s. I am going to build an enclosure in which I can stack 4-6 thermal mass solar window units, and have them up in the window during the winter months, and take them out in the summer. This will not be as efficient as the one in the new construction home above, but it will certainly help reduce my heating bill and carbon footprint. As for the balcony, I first need to replace all the single-pane glazing and then I can stack the thermal mass windows all along the bottom of the windows. I’ll build special shelves to make the process of putting them up for the winter, and removing them in the summer, easier. Traditional vertical sliding sash windows, are based on a simple design of two of sliding glass panels (top and bottom sashes) and have been part of the UK’s architectural heritage for over three hundred years. The sash window originates from 17th century England, where the first prototype, the single hung sash window, was created by Robert Hooke, an inventor who specialized in mechanics and architecture. The first type was more basic than those created nowadays and can still be seen in some historic buildings, predominantly of aristocratic ownership. Instead of replacing traditional sash windows, there are multiple reasons why owners should opt for restoring them to their initial appearance and at the same time optimize their thermal performance. It is best for the restoration process to be carried out by specialized companies and it should always be adapted to the specific type of sash windows and its particular deficiencies. Common sash window repair works (http://www.sashwindows.co.uk/services/sash-window-repairs.html) include: replacing sections of the box frame (normally the lower section of pulley stiles), lower sections of outer linings, bottom rails and window sills and replacing missing puttying and repainting. Using traditional carpentry and joinery methods with advanced modern epoxy resins ensures a permanent repair. This process does not alter their original appearance but instead, mends the alterations brought to it by time and natural phenomena. This is also a very effective process, and if done correctly, it maximizes heat retention in the home and minimizes heat and energy loss. Sash window draught proofing is less known perhaps, yet once a sash window has been overhauled and draught correctly, even old sash windows can equal or surpass modern ones in terms of energy efficiency. In this process, the staff beads and parting beads are replaced with new beadings with a draught proofing material permanently machined into the beads, top and bottom sash re-fitted and also fitted with a draught proofing material (usually a brush pile). weight to the correct counter balance ensuring the sash close with a minimum gap. Find more green Home Improvement Ideas at http://greenhomeideas.blogspot.com – Green Home Ideas blog. Glad you like my windows. Unfortunately these windows are not yet commercially available, but should be within the next year. The prototype shown in this blog is just that, a prototype. The cost to build this window was just to costly, and the inventor is redesigning it bring the cost down to an affordable level. The advancements he has made on this product in the last 6 months is incedible and I am sure the final product will not look like the windows shown, however they will be more efficient and affordable in the end. Tom, thanks for the info about these thermal mass windows, and I hope they become commercially available soon, so people could take advantage free solar energy and save money on their heating bill. I really love the idea of these windows. One concern I have from builder’s point of view – what happens if one of them breaks – how do you pull it our of that stack of windows? How are they put together? Hopefully I can find an opportunity to swing by that house in Marlboro and see how it is atually done. Like most great solar ideas, these may be too expensive to use. A great idea, but I’m sure they’ll be high priced. You do not essentially require a ton of pricey devices to comprehend the main advantages of passive solar heating. Passive heating accumulates and guides heat without the assistance of almost any mechanised or electric powered hardware . How many evacuated solar tubes would I need to heat an under the floor heating system in a home with 3 floors 32 feet by 44 feet? The home would be in zip 28777 Spruce Pine N.C.
You can also read his comment to this article above.